Redwoods have grown and prospered in many areas of Europe, Asia and North America since the warm Paleozoic Era over 160 million years ago. 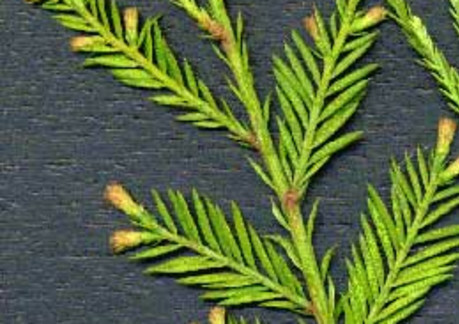 Changes in climate have restricted their natural range and eliminated all but three genera of redwood. Dawn Redwood, (Metasequoia glyptostroboides), is native to a remote area of central China. The Giant Sequoia, (Sequoiadendron giganteum), is native to the western slope of the southern Sierra Nevada mountain range in California. The Coast Redwood, (Sequoia sempervirens), is native to the Pacific Coast from southern Oregon to central California, extending not more than 50 miles inland. Coast redwoods follow the fog and grow best at less than 2,000 feet elevation in areas of heavy winter rains and moderate year round temperatures. They are the world’s tallest living things. Some of them tower above 360 feet. The name, Sequoia sempervirens, is Latin for "ever living" – an appropriate name for these trees since many are 600 to 1200 years old and some have lived more than 2,000 years! In fact, since coast redwoods often reproduce by root collar burl sprouting, the genetic material that comprises some trees may be thousands of years old. In late 2006, naturalists discovered a new tall tree, dubbed Hyperion. It is in the Redwood National Park in Humboldt County (near the original Tall Tree that was discovered in the 60s) in an undisclosed location. It rises to 379.1 feet, which is nearly six stories taller than the Statue of Liberty! 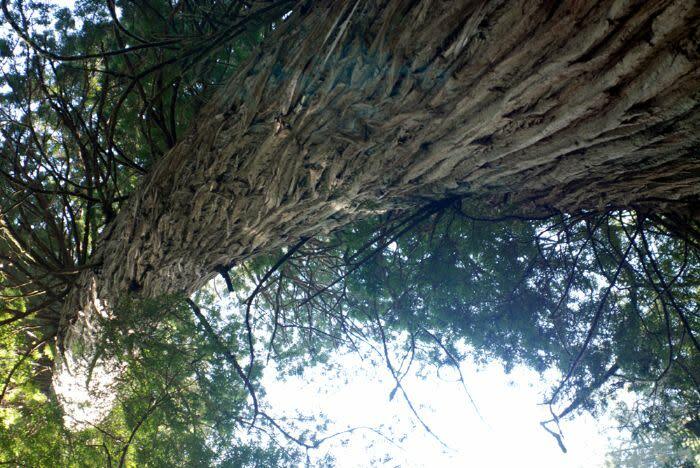 Find out more about the world's tallest tree. 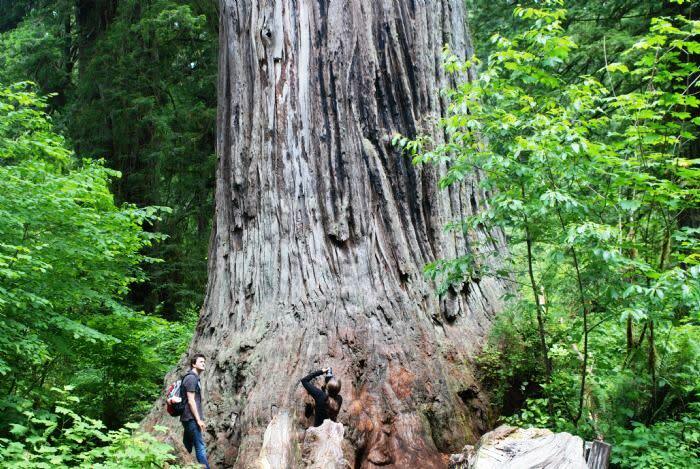 We also suggest these "ten must see" redwood trees. Statistics cannot begin to describe the beauty, grandeur and majestic serenity of these trees and the forests in which they grow best – dense groves on the alluvial flats alongside the streams of coastal northern California. The timeless beauty of these groves results at least in part from the dramatic contrast of many elements. The rough textured reddish bark of the redwood trees themselves, the delicate greenery of redwood foliage, the lush carpet of sorrel, mosses and ferns on the forest floor, sunlight filtering down over these colors and textures in ever-changing patterns all contribute to the entirety. Along with all this there is the special silence of a redwood grove – a living silence made up of many small sounds. The tranquility of a redwood grove is even more impressive when one remembers that all of the older trees in this forest have survived repeated windstorms, fires and floods. Their quiet, stately endurance to survive is awesome. The redwoods pithy bark and lack of true resin makes them naturally fire and insect resistant. Fire can cause damage to redwoods, sometimes creating a burnt hollow termed a "goosepen" by early settlers who used to pen chickens, geese and other livestock inside. Redwoods can grow tissue to heal fire scarring, sometimes completely covering the scar. They can also grow a buttress to compensate for a lean. Coast redwoods do not have a single taproot. Instead, they form a shallow network of relatively small roots that extend radially, up to a hundred feet from the base. The ends of the roots are fibrous, allowing them maximum surface area to obtain moisture and nutrients. If a flood buries the roots too deeply in silt, they have the ability to grow and explore their way upward toward more oxygenated soil. In addition to root collar burl sprouting, coast redwoods also reproduce from seeds. Flowering occurs in December and January with cones maturing over the spring and summer. In the autumn, the cones open on the trees and, on average, 50 to 100 tiny seeds sprinkle out. Seedlings survive best in exposed mineral soil that often occurs as a result of fire, flood and uprooted trees. Recently, the term "old growth" has become a focal point of forest policy discussions. It should be understood, however, that the term refers not to individual trees, but to the entire forest community. Old-growth is an imprecise term, for most wild forests are actually "all-aged" – old and young trees growing together. The crown of an old-growth redwood forest is likely to be very uneven. Some of the larger trees may have wind-damaged tops and relatively few branches. Competition to fill the canopy is apt to be fierce, and younger trees of different species may compete to fill the canopy. This multi-layered canopy efficiently traps moisture from fog so that even during the dry season the massive trunk of an ancient redwood may contain thousands of gallons of water. This reserve of moisture and a thick, protective bark enable redwoods to survive wildfires. In the Pacific Northwest, old-growth forests are ecosystems dominated by large conifers of an age predating European influence. 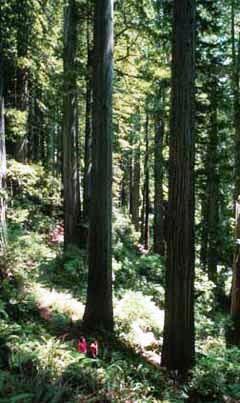 The dominant trees in coastal redwood forests range from several hundred years to over two thousand years. Snags are another characteristic feature of an old-growth forest. These large, erect, dead trees may remain standing for decades, or even centuries. Large, down trees may lie on the forest floor, gradually decaying, for many hundreds of years. Only in old-growth forests are young, old, dead and down trees all present at the same time. These forests are truly ancient. Their appearance has changed very little over time. Only a couple of trees per acre, per century need to appear to sustain the population. In a tropical rainforest, where vegetation is so thick as to be impenetrable, it seems like the ultimate in dense forest conditions. Surprisingly, however, the greatest accumulation of biomass (living and dead organic material) ever recorded on earth is in Humboldt Redwoods State Park, where an acre of stem mass (redwood tree trunks) alone has been estimated at 1,541 tons. When branch, leaf and root mass are added, the estimate increases to 1,800 tons per acre – seven times the density of biomass in an acre of tropical rainforest!